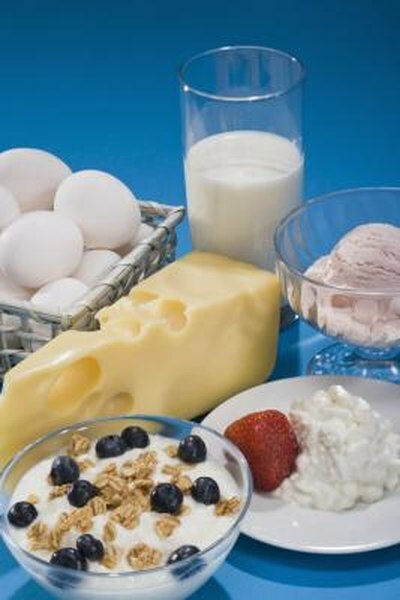 Lactose intolerance is a digestive difficulty in which you aren’t able to tolerate milk and many other dairy products. It occurs as a result of a deficiency in the digestive enzyme that helps you break down the sugar in milk. While the symptoms can be very uncomfortable, it isn’t a true allergy. Lactobacillus acidophilus is a type of bacteria that can digest milk sugar and may help you enjoy dairy. Lactose is the chemical name for milk sugar. Unlike table sugar, which tastes quite sweet, milk sugar doesn’t taste particularly sweet to humans. It’s chemically similar — though not identical — to table sugar. Both consist of two sugar units called monosaccharides that are chemically bonded together. In the case of lactose, the monosaccharides are glucose and galactose. Your intestine can’t absorb lactose — to absorb milk sugar, you have to break down lactose into glucose and galactose and absorb the monosaccharides individually. Your digestive tract relies upon chemicals called enzymes to assist in and speed up the process of digestion. The enzyme responsible for digesting lactose is called lactase. Many adults and almost all babies have lactase enzymes in their small intestines, though some adults lose the ability to produce lactase. If you’re lactase-deficient, you can’t consume lactose without uncomfortable symptoms including bloating, gas and intestinal discomfort. Humans use Lactobacillus acidophilus to digest the lactose in certain dairy products, which changes the nature of the milk and results in changes in flavor or texture. Yogurt, for instance, is the result of activity by Lactobacillus. When the bacteria break down lactose, they produce acid as a byproduct. The acid reacts with protein in the milk, making the protein coagulate into a creamy substance, which gives yogurt its texture. The acid also gives the yogurt a sour taste. Most lactose-intolerant individuals can consume yogurt because the lactose is pre-digested by bacteria. If you’re lactose intolerant, you can consume any dairy product that has been made with Lactobacillus acidophilus. Unfortunately, there aren’t many dairy foods made this way — yogurt, frozen yogurt, yogurt-based cheeses and fermented products like kefir are among the few. Some companies produce lactose-free dairy products by reacting the lactose with lactase enzyme directly. While this doesn’t require the action of Lactobacillus acidophilus bacteria, it does have the same effect — it pre-digests the lactose in the milk, and allows you to consume dairy comfortably.